We live in such an exciting time! You and I are watching things come to pass that the Bible prophesied about 2,000 years ago. I would not want to live in any other time in the History of the planet. We are approaching the ultimate battle called the Battle of Armageddon. Some of you may ask yourself, “What in the world is he talking about?” You can know and understand what the Bible has to say about the times between now and the Battle of Armageddon. Yes, you really can! The question is not, “Is there going to be a World War III?” It is in your Bible. There is not a one tenth of one percent chance that it is not going to happen. Another world war is coming, and it will be the biggest world war ever. According to the Bible, one out of three people on the earth will die in this war of all wars! The prophecy is found in Revelation chapter nine, verse 15: “And the four angels were loosed, which were prepared for an hour, and a day, and a month, and a year, for to slay the third part of men.” The “third part of men” would be over two billion people! Other translations read “one-third of the human race”, “one-third of all the people on earth”, “one-third of humanity”. They all say the same thing. A war is just ahead that will wipe out over two billion human beings! The Bible foretells a final seven-year period that will immediately precede the Battle of Armageddon and the Second Coming of Jesus to the earth. It also describes the specific event that will mark the beginning of this Final Seven Years. That’s the reason we call this prophesied event “the prophecy with a date on it.” All we have to do is watch for the initial event that marks the beginning of the timeline to then know that only seven years remain until the culmination. The events that I have just described are just the beginning of what is coming in the times just ahead. There are many questions about the timeline until the Battle of Armageddon and what it all means. The Bible has a lot to say about it. 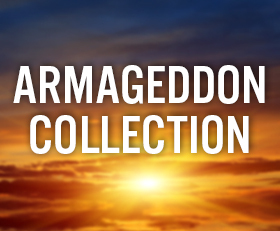 Endtime Ministries has come out with a new exciting special called the Armageddon Collection, and we cover subjects such as the 6th Trumpet War, The Final 7 Years, The Antichrist Revealed, and the World’s Greatest Revival Just Ahead!, to help you understand what is coming between now and the Battle of Armageddon.